For many Atlantic County parents with young children, it is financially impossible to afford the cost of life on only one salary. For single parents, staying at home with the kids is virtually out of the question. This is why more and more parents turn to daycare providers for help. Tiny Hands Learning Center has been offering expert child care services for parents in the Atlantic county area for many years. Our certified and experienced daycare providers are dedicated to making your child's experience at Tiny Hands rewarding and fun. We are not merely a babysitting service; we provide for your children an environment in which interaction, learning and development exercises are a part of every game and activity. We believe in treating each child with personalized care and attention, according to their unique needs and personality. We always take the time to get to know the children entrusted to our care and provide parents with progress reports at the end of each day. Our goal is to assist Atlantic County area parents in helping each child achieve his or her full potential. To this end, we strongly encourage each parent to come forward with questions at any time, and are more than happy to take the time necessary to discuss your child's progress or any other concern you (or we) may have. Tiny Hands Learning Center understands that there is nothing in the world more important than the well-being and happiness of your children. Each and every one of our daycare providers is in our employ for one reason only: because they love working with and caring for kids. Every member of our staff has a child care certification, which includes being up to date on first aid and child CPR. If you are looking for a team of professional, responsible daycare individuals who love working with children and you live in or around the Atlantic County area, then Tiny Hands Learning Center is here for you. Please do not hesitate to contact us or, better still, come by our Egg Harbor Township daycare center. We will be happy to give you a tour and answer any questions you may have concerning our facility and services offered to parents. 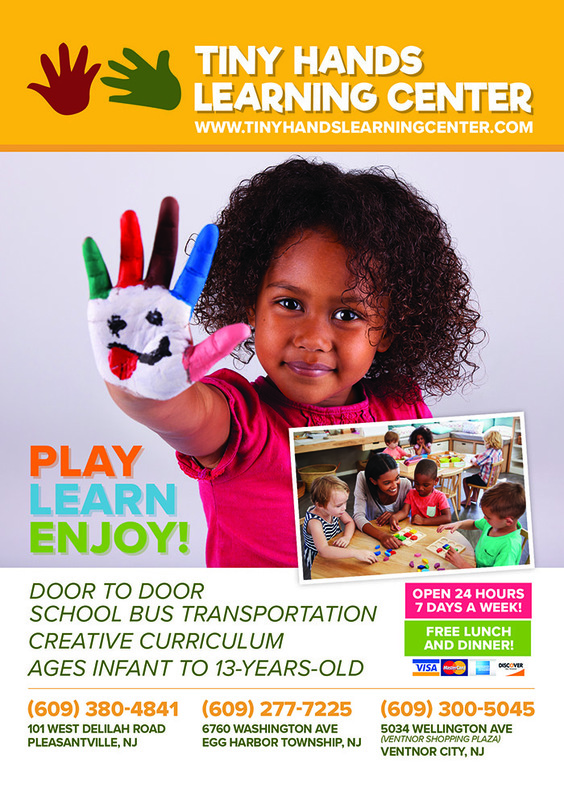 For more information on Tiny Hands Learning Center curriculum, or if you would like to learn more about our daycare center in general, please do not hesitate to contact or visit us in person.